If there is one certain aspect of my skincare routine that I am sure to do like clockwork, it would be double cleansing. I don't know what it is about taking off all the grime, wiping away the day's stress and impurities with two cleansing steps, but it's become a vital part of my ritual. As I've said before, I really don't like taking off my makeup, but I do like cleansing my face. If I'm wearing some light bb cream, sunscreen, and so on, it's not so much of a chore. If you don't know what double cleansing is, it's basically a two step process: first using an oil-based cleanser to remove makeup, sebum, and sunscreen (with a cleansing oil, cleansing water, balm, etc), and then a second cleanser to wash away sweat, other impurities, etc, overall clean your face (with a gel, foam, cream, etc). Korean skincare really promotes this system of double cleansing and nowadays it's becoming a lot more common knowledge with Kbeauty booming in popularity. 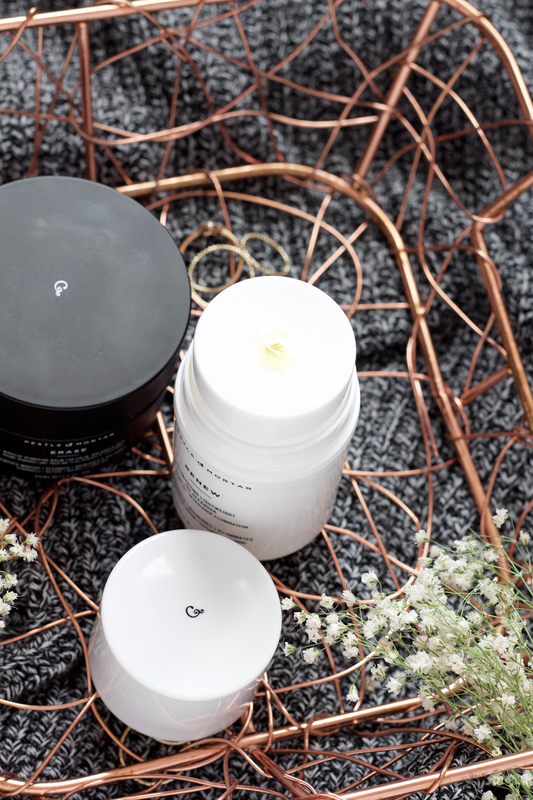 Pestle & Mortar is an Irish brand I found through Instagram after seeing their Superstar Retinol Night Oil featured in people's routines. I decided to pick it up and have used it a couple of times so far (I don't have any real thoughts yet but I'll have a review up soon). 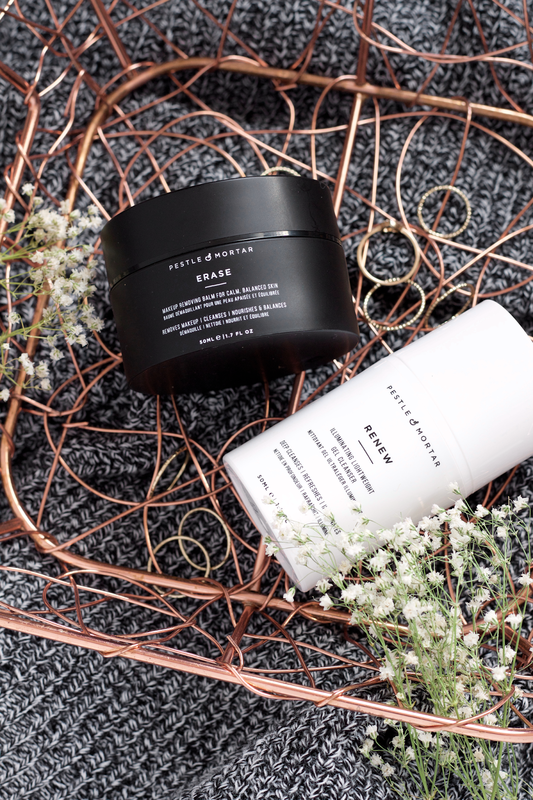 Pestle & Mortar actually reached out to me after hearing me talk about how I was really looking forward to their new Erase & Renew Double Cleansing System to come out here in the States. They kindly sent me this to review and I've been using these two products for a couple weeks now, so I'm finally ready to share with you all my thoughts about them. If you're wanting to learn more about Pestle & Mortar, there is a wonderful introduction video (here) featuring the founder of the brand, Sonia Deasy. Pestle & Mortar is a family run business, and the name itself connects to Sonia's family background with natural healing. They believe that every single ingredient matters, with "Simplicity, Natural Solutions, and Less is More" being their philosophy. It's with this philosophy that they dedicate their time and effort to creating only the best natural products possible. 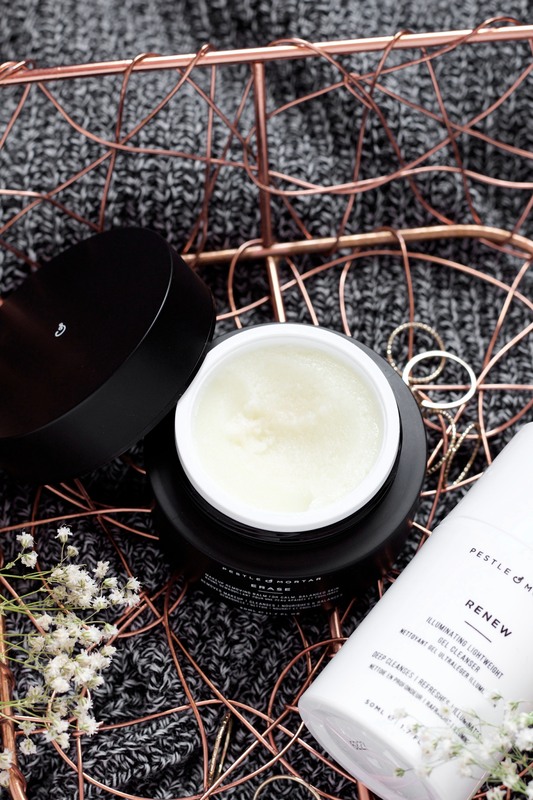 Erase & Renew: The Double Cleansing System* is made up of a makeup removing balm, Erase, and a gel cleanser, Renew. Also included in their three step system is a double-sided cleansing facial cloth. One side features an exfoliating muslin and the other cotton. Erase & Renew promotes an easy way to ease into double cleansing, especially since you only need to do it at night. You also can use Renew in the mornings, if you like. 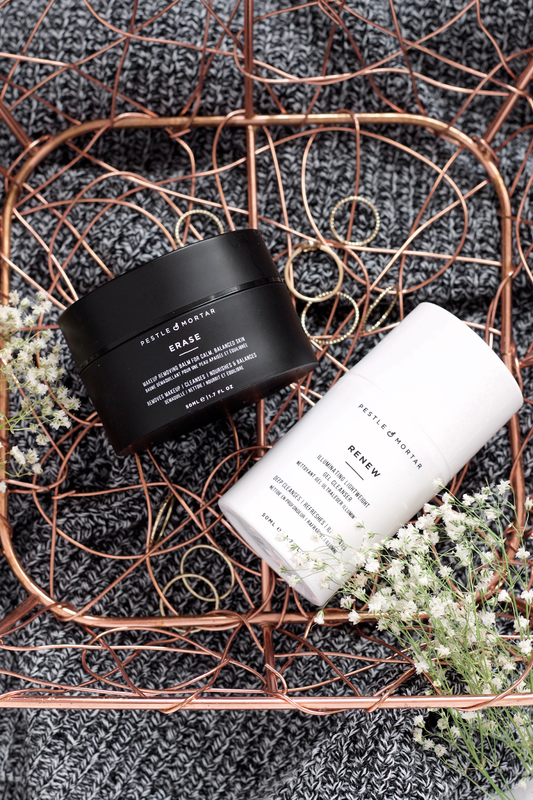 These two products won't strip away your skin's natural barrier and instead offer further nourishment and balance, helping to prep for your next skincare routine steps. Without fully cleansing your face, your next steps won't be as effective and the products also won't be able to work their best. Therefore your first steps are your most important ones when it comes to your routine and setting up for how your skin will be able to accept what products you will be applying. These are both free from parabens, mineral oil, silicones, sulphates, propylene glycol, and synthetic fragrances. Both Erase and Renew have an expiration of 12 months after opening. Erase is a makeup removing balm that breaks down into an oil once you massage it into your skin, with little sugar-y-like granules that softly exfoliate. 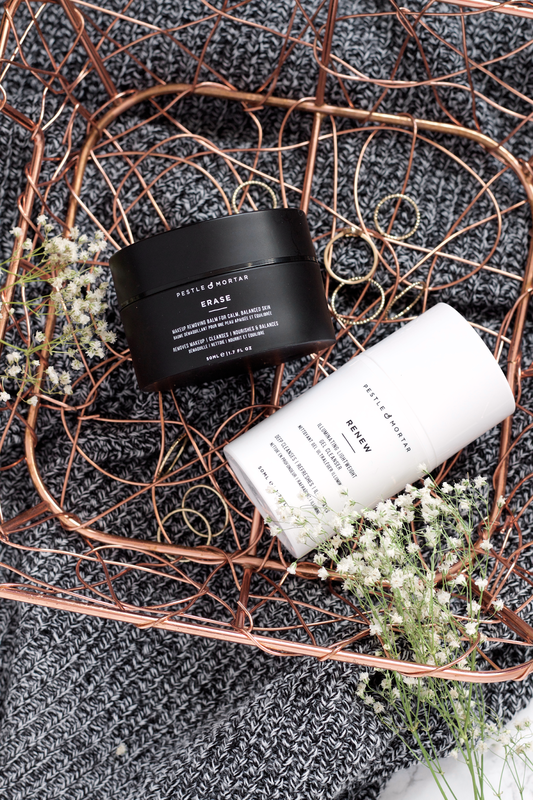 Pestle & Mortar recommends putting a small amount in your hands and rubbing together before applying onto dry skin, but I've simply been applying it straight on so you can do either/or. I'm very careful what products I use around my eye area so I've actually never used it to remove eye makeup, but I've read reviews that have done so successfully. This really gets everything off and easily so, the granules are not at all abrasive and wonderfully exfoliate your skin. The oil thats broken down always feels very moisturizing on my skin and I never have to use a lot of it to get makeup or sunscreen off. The scent is a mixture of lavender and subtle rose, I really enjoy how soft it is. I have taken this balm off with and without the facial cloth, and I would say most times I prefer to take it off with the cloth. The ingredients in this balm are a nourishing blend of botanicals: with grape seed oil, sunflower seed oil, meadowfoam seed oil, pumpkin seed oil, prickly pear seed oil, lavender oil, and rose geranium flower oil. Grape seed oil being the forefront ingredient provides a light, non-greasy base, along pumpkin seed oil and prickly pear seed oil's fatty acid content help to retain moisture. This lush blend does a wonderful job at not overpowering one another, rather being very cohesive and compatible for even oily skin like mine. Ingredients: Vitis Vinifera (Grape) Seed Oil, Helianthus Annuus (Sunflower) Seed Oil, Caprylic /Capric Triglyceride, Cetyl Esters, Cetearyl Alcohol, PEG-60 Almond Glycerides, Sorbitan Stearate, Limnanthes Alba (Meadowfoam) Seed Oil, Cucurbita Pepo (Pumpkin) Seed Oil, Opuntia Ficus Indica (Prickly Pear) Seed Oil, Lavandula Angustifolia (Lavender) Oil, Pelargonium Graveolens Flower Oil, Linalool, Geraniol, Citronellol. Renew is a light, gel cleanser that is step two of The Double Cleansing System. This gel cleanser is supposed to leave your skin hydrated, glowing, and bright. I definitely do agree with that description of it. I've found that my skin feels very soft and fresh afterwards, especially. Pestle & Mortar recommends one pump applied to dry skin, and removing it with the cleansing cloth. I use it both with and without, and I don't really have one preferred way to remove this cleanser. I do enjoy feeling the cleanser under my fingers as it melts off the impurities and washes away, but I also enjoy the warmth of the cloth and taking it off that way too. It's really up to your own personal preference! This has a very distinct citrus-y scent but it's subtle enough to not bother me. I really enjoy using this as part of the double cleanse and have also used it in my morning routines, but it works beautifully in this two part system. The gel cleanser glides so easily and I really enjoy massaging it into my skin. It's such a lovely cleanser. The ingredients from the balm mesh so wonderfully with the botanicals found in this product. The mango fruit extract and papaya fruit extract work effectively to help refine skin texture and brighten, while meadowfoam and jojoba work to nourish and provide moisture. Ingredients: Caprylic/Capric Triglyceride, Glycerin, Simmondsia Chinensis (Jojoba) Seed Oil, Aqua, Carica Papaya (Papaya) Fruit Extract, Mangifera Indica (Mango) Fruit Extract, Leuconostoc/Radish Root Ferment Filtrate, Superoxide Dismutase, Limnanthes Alba (Meadowfoam) Seed Oil, Citrus Aurantium Bergamia (Bergamot) Fruit Oil, Tocopherol, Sucrose Palmitate, Dehydroacetic Acid, Sucrose Stearate, Benzyl Alcohol, Limonene, Linalool, Annatto (CI75120). Pestle & Mortar is indeed a brand to keep your eyes on. I'll have my review of their Superstar Retinol Night Oil up once I'm done testing it, but so far so good. I'm excited to try the two other products from their line, Hydrate Moisturizer and Pure Hyaluronic Acid Serum. Also, if you sign up to their newsletter on their website, you can get 10% off your first order. Update: You can now buy these two products individually online here (Renew) and here (Erase)! I'd love to hear from any of you if you've tried their products!